Objective Calgranulin-C (S100A12) is a new faecal marker of inflammation that is potentially more specific for inflammatory bowel disease (IBD) than calprotectin, since it is only released by activated granulocytes. We compared calgranulin-C and calprotectin to see which of the two tests best predicted IBD in children with chronic abdominal pain and diarrhoea. Design Delayed-type cross-sectional diagnostic study. Setting and patients Previously undiagnosed patients aged 6–17 years, who were seen in paediatric clinics in the Netherlands and Belgium, sent in a stool sample for analysis. Patients with a high likelihood of IBD underwent upper and lower endoscopy (ie, preferred reference test), while those with a low likelihood were followed for 6 months for latent IBD to become visible (ie, alternative reference test). We used Bayesian modelling to correct for differential verification bias. Main outcome measures Primary outcome was the specificity for IBD using predefined test thresholds (calgranulin-C: 0.75 µg/g, calprotectin: 50 µg/g). Secondary outcome was the test accuracy with thresholds based on receiver operating characteristics (ROC) analysis. Results IBD was diagnosed in 93 of 337 patients. Calgranulin-C had significantly better specificity than calprotectin when predefined thresholds were used (97% (95% credible interval (CI) 94% to 99%) vs 71% (95% CI 63% to 79%), respectively). When ROC-based thresholds were used (calgranulin-C: 0.75 µg/g, calprotectin: 400 µg/g), both tests performed equally well (specificity: 97% (95% CI 94% to 99%) vs 98% (95% CI 95% to 100%)). Conclusions Both calgranulin-C and calprotectin have excellent test characteristics to predict IBD and justify endoscopy. The calprotectin stool test has been promoted as a non-invasive and easy interpretable triage tool to predict inflammatory bowel disease (IBD) in children. A calprotectin concentration below 50 µg/g has been proposed to rule out IBD and not to proceed to endoscopy. When this threshold is used, a considerable proportion of children and teenagers with chronic abdominal pain and diarrhoea are exposed to a pointless invasive procedure. This large-scale diagnostic study in a real-life cohort of children with chronic abdominal pain and diarrhoea shows that the new calgranulin-C stool test has significantly better specificity than calprotectin. 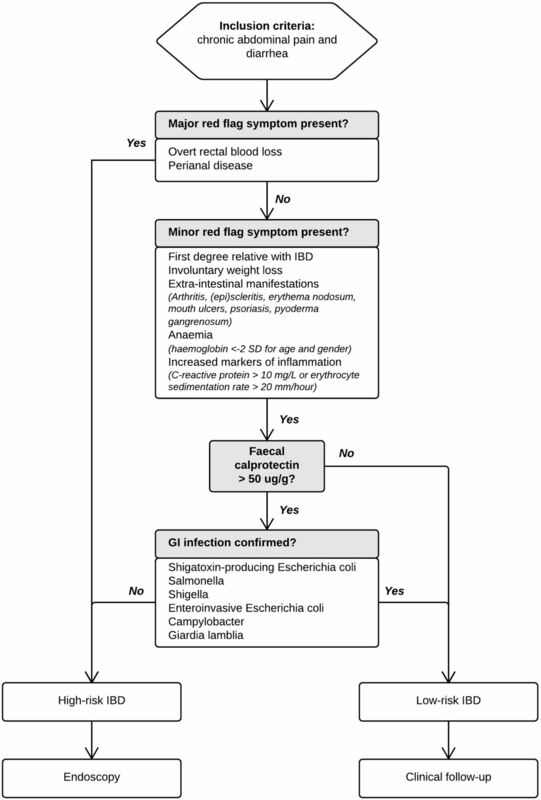 When the calprotectin stool test is used, a two-threshold strategy is recommended with concentrations below 50 µg/g to rule out IBD and concentrations above 400 µg/g to rule in IBD and proceed to endoscopy. Inflammatory bowel diseases (IBDs), including Crohn’s disease and ulcerative colitis, are lifelong conditions that often begin in childhood. Suspicion is raised in children and teenagers with chronic abdominal pain and diarrhoea. Additional red flag symptoms including rectal bleeding, weight loss and anaemia increase the suspicion of the condition. Endoscopic evaluation of the upper and lower gastrointestinal tract with biopsies for histology is essential to diagnose IBD and to differentiate Crohn’s disease from ulcerative colitis and IBD unclassified, start appropriate therapy and prevent progressive bowel damage.1 Many children consider endoscopy and the required bowel preparation to be uncomfortable.2 Identification of children with a low likelihood of IBD would justify a non-invasive ‘watchful waiting’ strategy, while identification of those with a sufficiently high likelihood of IBD would justify urgent referral to specialist services for endoscopy. In recent years, the stool calprotectin test has been promoted as a safe and easy interpretable triage tool for endoscopy.3 4 Calprotectin is mainly released by neutrophil granulocytes, but other cells including monocytes and epithelial cells do also excrete this protein.5 To date, a calprotectin concentration below 50 µg/g has been proposed to rule out IBD and not to proceed to endoscopy.6 7 However, there are concerns about the mediocre specificity of the test at this threshold, which may give rise to a considerable proportion of children and teenagers proceeding to a pointless invasive procedure. 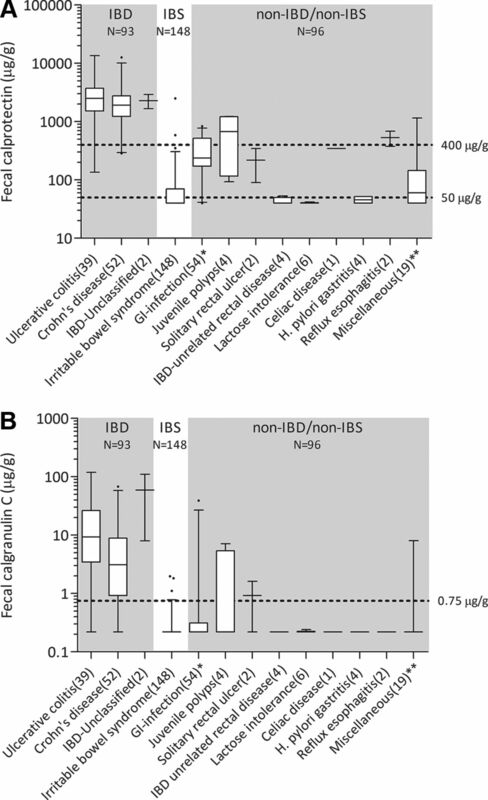 Calgranulin-C (S100A12) is a less frequently investigated marker of intestinal inflammation that is almost exclusively released by activated granulocytes.5 In previous case–control studies, calgranulin-C showed diagnostic promise with better specificity compared with calprotectin,8–10 but large studies in a prospective cohort with chronic abdominal pain and diarrhoea are lacking. The aim of this study was to compare calprotectin and calgranulin-C to see which of the two markers best predicted IBD in children and teenagers with chronic abdominal pain and diarrhoea. Patients were recruited from 16 secondary and 3 tertiary level hospitals in the Netherlands and Belgium. They were eligible when aged between 6 years and 17 years. The flow of patients from the first hospital visit to the choice of the reference test was described comprehensively in our published study protocol.12 In brief, during the first hospital visit, baseline characteristics, date of birth, presence of major and minor red flag signs and symptoms for IBD and use of non-steroidal anti-inflammatory drugs were entered on the study website (www.cacatustudie.eu). A stool specimen was collected at home and sent to the hospital laboratory of the coordinating study centre, where it was immediately tested for calprotectin and colon pathogens (including Shigatoxin-producing Escherichia coli, Salmonella, Shigella, Enteroinvasive E. coli, Campylobacter and Giardia lamblia) with a real-time multiplex PCR technique. Residual faeces was stored at −80°C for calgranulin-C batch testing at a later stage. Stool calprotectin concentrations (μg/g) were measured with the fCAL ELISA (BÜHLMANN Laboratories AG, Schönenbuch, Switzerland) and stool calgranulin-C concentrations (μg/g) with the commercially available Inflamark ELISA (CisBio Bioassays, Codolet, France), both on a Dynex DS2 Automated ELISA System (Alpha Labs, Easleigh, UK) in the same laboratory. The extraction and measuring technique of calgranulin-C was previously described in detail.13 In discordant pairs (ie, increased calprotectin and normal calgranulin-C, or vice versa), we did a post hoc analysis of potential viral causes (adeno, entero, astro, rota, noro, parecho and sapovirus). Laboratory technicians were blinded for symptoms filled in on the website. The attending paediatricians were informed of the calprotectin and PCR result for bacteria and G. lamblia, but they were blinded for the calgranulin-C and PCR result for viruses. The predefined thresholds used in this study were 50 µg/g for calprotectin and 0.75 µg/g for calgranulin-C.
We used an automated IBD Risk Stratifier (figure 1) to advice paediatricians whether patients should proceed to endoscopy (the preferred reference standard) for verification of IBD, or whether they should be followed up clinically for possible latent IBD to become visible (the alternative reference standard). Paediatricians could deviate from this advice for documented clinical reasons. Endoscopy was performed under general anaesthesia by an experienced paediatric gastroenterologist in one of six participating centres. Both upper and lower gastrointestinal tracts were evaluated according to the revised Porto criteria,14 and biopsies were taken from every bowel segment. Histopathological examination was performed by experienced histopathologists. Endoscopists and histopathologists had access to clinical information and calprotectin results but were blinded for the results of the calgranulin-C test. In case patients were assigned to the alternative reference standard, they were re-evaluated using the IBD Risk Stratifier until 6 months after inclusion. In case the initial risk stratum changed to ‘high-risk’, endoscopy was performed ultimately. Algorithm explaining the multistep IBD Risk Stratifier used to standardise the assignment of patients to either endoscopy or clinical follow-up. GI, gastrointestinal; IBD, inflammatory bowel disease. This study was performed according to the Declaration of Helsinki. This study was conducted with the approval of the Medical Ethical Committee of the University Medical Center in Groningen (METc 2013/503) and Antwerp University Hospital (14/40/407). All participants aged 12 years and above and their legal guardians gave informed consent to use data generated by routine medical care. The data were collected and recorded by the investigators in such a manner that subjects could not be identified, directly or through identifiers linked to the subjects. A total number of 354 children and teenagers with chronic abdominal pain and diarrhoea were recruited into the study between September 2014 and September 2016, and 337 were included in the final analysis. In the early stages, 142 patients proceeded to endoscopy, while 195 were assigned to clinical follow-up. Another 19 children from the low-risk group were referred for endoscopy at a later stage. Eventually, 48% of patients in the study cohort (161 of 337) underwent endoscopy, of which 93 were diagnosed with IBD. The patient study flow is shown in figure 2. Baseline characteristics are presented in table 1. The patients in the high-risk stratum were older, had more red flag symptoms and higher calprotectin concentrations than those in the low-risk stratum. Three patients who were initially in the low-risk stratum were later found to have IBD. All three had elevated faecal calprotectin concentrations (range 340–480 µg/g) and a positive PCR result. Ongoing or worsening symptoms despite eradication of the pathogen made the clinician decide to proceed to endoscopy. The distributions of calprotectin and calgranulin-C values per final diagnosis are shown in figure 3. Study flow diagram showing differential verification bias. We compared calgranulin-C and calprotectin to see which of the two stool tests best predicted IBD in children with chronic abdominal pain and diarrhoea. Patients stratified by their paediatrician as high risk for IBD underwent endoscopy. Those with a low predicted risk were followed for 6 months. The probability that a patient truly had IBD given that they were in the high-risk stratum was 63%. Likewise, the probability that a patient in the low-risk stratum was eventually diagnosed with IBD was 1.5%. IBD, inflammatory bowel disease; NPV, negative predictive value; PPV, positive predictive value; Sens, sensitivity; Spec, specificity. Box and whisker plot for calprotectin (A) and calgranulin-C (B) concentrations per diagnosis. Whiskers represent the 95% CI. Number of cases in brackets. *The GI infection group had either bacterial colon pathogens or Giardia lamblia. **The miscellaneous group included bile-salt diarrhoea (n=1), haemolytic uremic syndrome (n=1), Mediterranean fever (n=1), fructose overload (n=1), spondylarthropathy (n=1), Hirschsprung’s disease (n=1) and allergic enterocolitis (n=1). The remaining 12 were ‘non-IBD, not otherwise specified’. GI, gastrointestinal; IBD, inflammatory bowel disease; IBS, irritable bowel syndrome. Figure 4A shows the diagnostic accuracy measures based on predefined thresholds for calprotectin (50 µg/g) and calgranulin-C (0.75 µg/g), calculated with the Bayesian correction method. In this analysis, calgranulin-C has significantly better specificity (97.3% (95% credible interval (CI) 94.1% to 99.4%) vs 71.3% (95% CI 63.3% to 79.0%)) and better positive predictive value (92.7% (95% CI 84.6% to 98.4%) vs 72.7% (95% CI 63.8% to 81.0%) compared with calprotectin. The numerical data are shown in online supplementary file 2. Diagnostic accuracy measures of the calprotectin (grey square) and calgranulin-C test (black diamond) to diagnose IBD in children. Graph A shows the results when predefined thresholds are used (50 µg/g and 0.75 µg/g, respectively). Graph B shows the results when ROC-based optimal thresholds (400 µg/g and 0.75 µg/g) are used. Whiskers represent the 95% credible interval. IBD, inflammatory bowel disease; NPV, negative predictive value; PPV, positive predictive value. The optimal (ROC-based) threshold for calprotectin was 400 µg/g, while the optimal threshold of calgranulin-C was equal to the predefined threshold (0.75 µg/g). The difference in specificity and positive predictive value disappeared when optimal thresholds were compared. A graphical representation of the equivalence between calprotectin and calgranulin-C for the complete study cohort (verified with either reference test) is shown in figure 4B. ROC curves are presented in supplementary file 3. Figure 5 shows that 306 of 337 pairs of calprotectin and calgranulin-C results were concordant (91%). Discordant pairs (n=31 (9%)) are described in detail in supplementary file 4. Thirteen children with a discordant result were diagnosed with IBD. Two cases were missed with the calprotectin test (threshold 400 µg/g) and 11 cases were missed with the calgranulin-C test (threshold 0.75 µg/g). 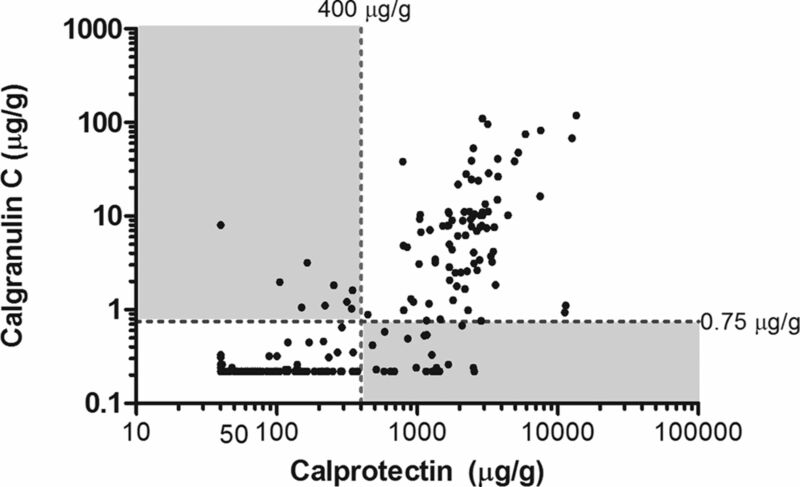 Scatter plot showing concordant and discordant pairs of calprotectin and calgranulin-C measurements. The broken lines represent the ROC-based optimal thresholds for calprotectin (400 µg/g) and calgranulin-C (0.75 µg/g). White fields represent concordant pairs (91%), while grey fields represent discordant pairs (9%). ROC, receiver operating characteristic. The clinical presentation of paediatric IBD is frequently non-specific and overlaps with irritable bowel syndrome (IBS). Early differentiation is important to avoid delay in proceeding to endoscopy on the one hand and to avoid unnecessary invasive procedures on the other. The mere existence of this trade-off means that a non-invasive and highly discriminative test is needed. We compared the calprotectin and calgranulin-C stool test to see which of the two markers best predicted IBD in children and postulated that the latter probably had better specificity. In this large-scale paediatric diagnostic accuracy study on markers of intestinal inflammation, we show that calgranulin-C has better specificity for IBD than calprotectin, provided the use of common thresholds. When optimal (ROC-based) thresholds are used (ie, calprotectin: 400 µg/g; calgranulin-C: 0.75 µg/g), both tests have exceptionally high sensitivity and specificity to diagnose IBD. Well-designed studies on the discriminative power of calgranulin-C are scarce. An Australian research team previously reported on a study comparing calprotectin and calgranulin-C.9 They obtained stool samples from 61 children (2–16 years old) who presented with gastrointestinal symptoms prior to admission for gastrointestinal endoscopy. The predefined threshold used for calgranulin-C in their study cohort (10 µg/g) was substantially higher than the one we used (0.75 µg/g).8 13 The difference is likely to be explained by differences in assays and selection of patients. We included a fair amount of patients that did not proceed to endoscopy, which increases the applicability of our results for populations seen in non-specialised centres. An important methodological flaw in the Australian study was the omission of a fair comparison of optimal thresholds for both markers, which may have resulted in an overinterpretation of calgranulin-C test accuracy. Several recently published meta-analyses have shown that the calprotectin stool test has good negative predictive (‘rule-out’) value at the commonly used threshold (50 µg/g).3 4 6 A large share of the studies included in these meta-analyses had a case–control design that gives rise to spectrum bias and overestimation of test accuracy relative to the real-life practice.19 We avoided spectrum bias and therefore expected to find more modest accuracy measures than previously reported. 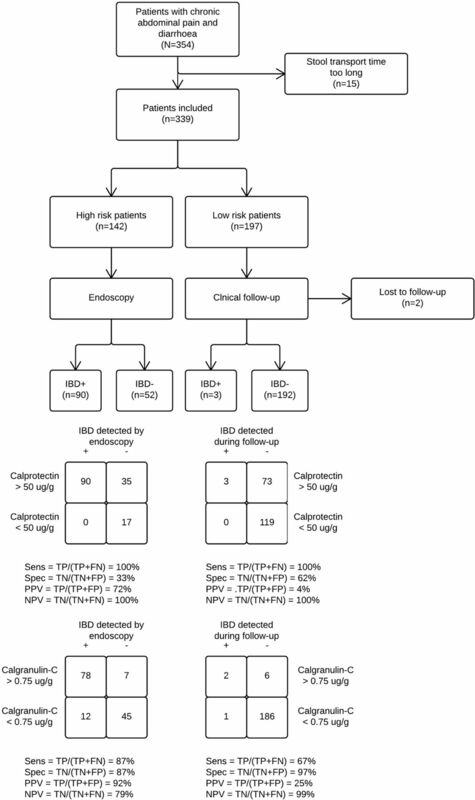 Contrary to our expectations, we found that the good rule-out value of calprotectin still holds in a heterogeneous study population with chronic abdominal pain and diarrhoea. At the threshold of 50 µg/g, the specificity of the calprotectin test for the detection of IBD (71%) was comparable with previously reported values. The ROC-based optimal threshold was higher than in previously reported papers. We used the calprotectin ELISA assay of BÜHLMANN Laboratories, which is known to report higher concentrations than the Immunodiagnostik and Eurospittal assays.20 This so-called between-assay variability indicates the need for assay standardisation. In the meantime, each laboratory should investigate transferability of the manufacturer’s thresholds to its patient population and, if necessary, determine its own local thresholds to optimally identify IBD and avoid the need for further costly and invasive investigations. 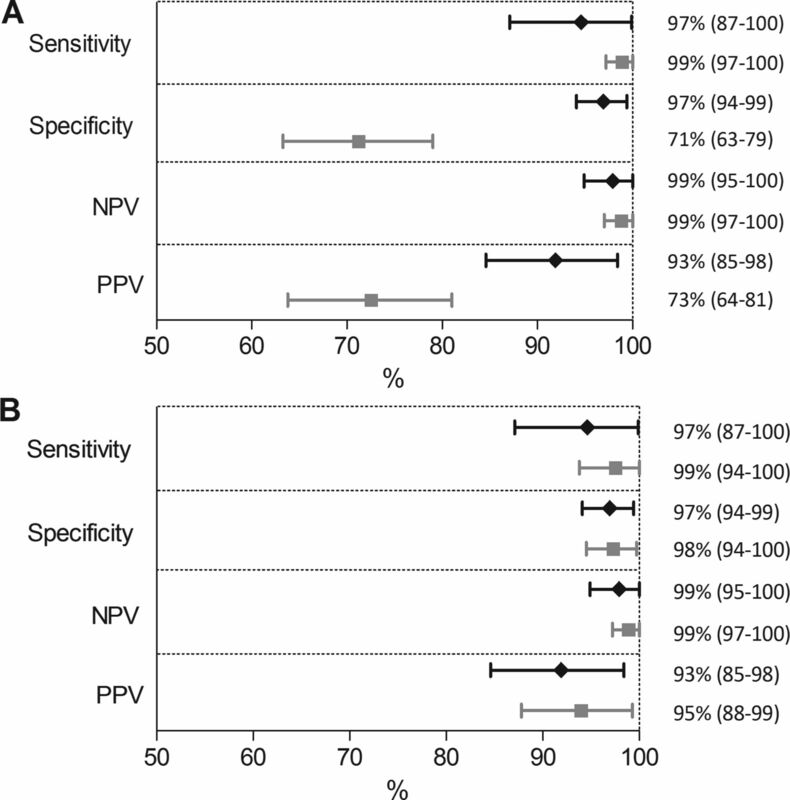 This large-scale, multicentre, cross-border accuracy study better reflects ‘real-life’ practice than any other previously published study on stool tests for screening and selecting children for endoscopy. We used an automated IBD Risk Stratifier to standardise the assignment of patients to either the high-risk or low-risk stratum. The cooperation of both secondary and tertiary level hospitals in this study promotes the generalisability of our results and conclusions. The attending paediatricians were not blinded for the calprotectin results. This led to a deviation from the automated advice of the IBD Risk Stratifier in 25% of cases. In supplementary file 5, we show that this especially happened in the calprotectin grey zone between 50 µg/g and 400 µg/g. Knowledge of the calprotectin concentration also led to a diagnostic work-up bias that is usually the case in screening studies where only patients with a positive index test result move on to the reference standard. We reduced this bias by following the low-risk patients for 6 months for possible latent IBD to become visible. One might argue that this observation period was not sufficiently long, but we are confident that the majority of initially missed cases with IBD would become apparent within this time. Both calprotectin and calgranulin-C have excellent test characteristics to predict IBD in children and teenagers with chronic abdominal pain and diarrhoea and justify endoscopy. In this inception cohort, the calprotectin action threshold for proceeding to endoscopy is around 400 µg/g, and this underlines the relevance of using a ‘two-threshold strategy’ as proposed in several publications.7 21–23 The grey zone between the commonly used threshold of 50 µg/g that demarcates the normal range and the action threshold gives room for shared decision making with the patient and his or her parents, in which presence of major red flag symptoms and impact on daily functioning of the child may additionally guide management. One can opt for watchful waiting with monthly monitoring of stool calprotectin or decide to move on to endoscopic evaluation. When calprotectin concentrations are truly out of range, and gastrointestinal infections and non-steroidal anti-inflammatory drug use are excluded, the patient should proceed to endoscopy to rule in IBD. A two-threshold strategy does not seem to be of added value when the calgranulin-C stool test is picked as the triaging tool of preference. Measuring calprotectin or calgranulin-C concentrations in stool is a useful triage tool for identifying patients who are most likely to need endoscopy for suspected IBD. The discriminative power to safely exclude the disease (specificity) is significantly better than previously reported. When the optimal ROC-based thresholds are used (calprotectin: 400 µg/g; calgranulin-C: 0.75 µg/g), both tests perform equally well in secondary and tertiary level hospitals. technicians of the Departments of Laboratory Medicine and Microbiology at the University Medical Center Groningen.
. Assessment of the accuracy of diagnostic tests: the cross-sectional study. In: Knottnerus JA , Buntinx F , eds. The evidence based of clinical diagnosis: theory and methods of diagnostic research. Chichester: Wiley-Blackwell, 2009:42–62.
. JAGS: A program for analysis of Bayesian graphical models using Gibbs sampling. 124. Vienna, Austria: Proceedings of the 3rd International Workshop on Distributed Statistical Computing, 2003:124–5. Contributors PFvR conceived the study. AH, EVdV, AMK and PFvR initiated the study design. PFvR is the grant holder. AH conducted the primary statistical analysis. DvR conducted the Bayesian modelling. SVB, TZH, ZY, GG-dJ and RS contributed more than 5% of the total number of participants. AH and PFvR drafted the first version of the article. All other authors revised the article critically for important intellectual content. All authors gave final approval of the version to be submitted. Funding This study was supported by a grant from CisBio Bioassay (producer of Inflamark). Disclaimer Neither company had a role in the design, execution, analyses, and interpretation of the data, or in the decision to submit the results. Competing interests PFvR and AH received financial support from BÜHLMANN Laboratories AG (Schönenbuch, Switzerland) for other ongoing trials. Ethics approval Medical Ethical Committee of the University Medical Center in Groningen (METc 2013/503) and Antwerp University Hospital (14/40/407). Author note Study protocol: Published in BMJ Open 2017;7:e015636.